The mussels with spaghetti dish is among the traditional Skopelos recipes that attract the taste connoisseurs. 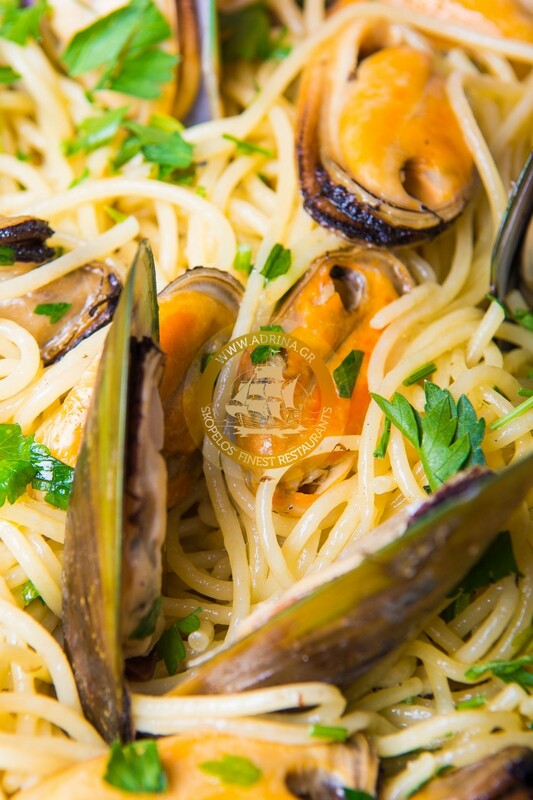 The fresh mussels when combined with homemade spaghetti create a nutritious delicacy that excites your senses. The success of this dish lies on the carefully cooking method of the mussels as well as the boiling of the spaghetti. They need to be cooked al dente so that they will compliment the mussels perfectly. Take a look below to learn the steps we take to present to you mussels with spaghetti, one of the most delicious traditional Skopelos recipes. First, we heat some extra virgin olive oil in a pan (high heat) and add the mussels. We stir the pan frequently and wait until the shells are open. The shells that remain unopened after 5 minutes are discarded. Then, we add some garlic and cook for another minute before adding white wine, lemon juice and fresh thyme (cooked together for less than a minute). At the same time in another pot we boil the spaghetti for less than 7 minutes. When done, we add the cooked spaghetti to the pan and stir well. After a minute we serve the mussels with spaghetti on a plate while hot. When you arrive in Skopelos you are prepared to enjoy all things the local cuisine has to offer. Mussels with spaghetti should be on the top of your list of the traditional Skopelos recipes you want to taste. You will know why after the first bite!